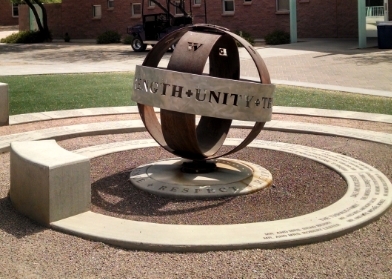 Notre Dame Preparatory is a Catholic diocesan college preparatory school in the Diocese of Phoenix with a co-ed enrollment of 900 students. Located in Scottsdale, Arizona, we strengthen the minds, bodies and souls of high school students by integrating faith into a challenging college preparatory curriculum. NDP promotes academic excellence, instills moral values and encourages lifelong service. If you are looking for a challenging and committed private Catholic school to serve your family, we invite you to consider Notre Dame Prep. Since its founding in 2002, Notre Dame Prep has been dedicated to keeping God and family as our priority. We believe the greatest service we can provide our students is to create an environment that inspires a love of learning and a commitment to faith and justice in the service of others. The NDP community embraces families from all corners of the metropolitan Phoenix area, representing the ethnic, racial, socio-economic and religious diversity of the region. NDP is accredited by both the Western Catholic Educational Association and AdvanceED.